Forty students (grades K-8) will present a comedy farce - "The True Story of Snow White and the Seven Dwarfs?" - this weekend through Community Education's annual mini-theater. The cast will present their play on Friday, March 10, at 7 p.m. in the school auditorium and on Saturday, March 11, at 1:30 p.m. also in the auditorium. The play, written by directors Colleen Pelton and Sue Teicher, uses part of the Disney story involving Snow White and the Seven Dwarfs as well as Old MacDonald and his farm animals; Santa and his reindeer; and even the Paynesville Junior Bullettes. The dwarves, including some unusual ones, go on strike at the gold mine against the evil queen, with the dwarves wanting shorter hours, more pay, and compensation for black lung. The play, according to the directors, involves parts of familiar stories and lots of imagination. Pelton and Teicher wrote the play five years ago and revised it for this year's mini-theater, including adding parts. The 40 students auditioned for parts on Monday, Feb. 27, and had seven rehearsals for the production. The play should last less than an hour with refreshments following. Admission is $3 for adults and $1 for students. Preschoolers are free. Making funny faces at rehearsal last week were: (front) Teirrah Syvertson, Kylie Bergman, Sydney Riley, Wesley Ford, Alyssa Meed, Megan Schmitt, Larry Carlson, and Katelyn Dingmann; (kneeling) Kaitlyn Haase, Mackenzie Haines, Allison Poepping, J.T. 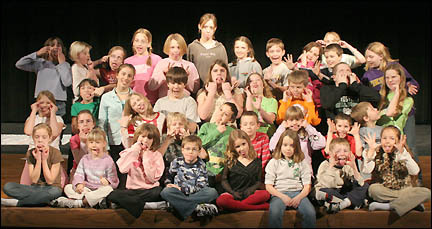 Gunderson, Bradley Zimmerman, Amanda Hawkinson, Noah Andersen, and Erik Malling; (middle) Taylor Buchta, Lauren Spaeth, John Ruprecht, Melissa Hawkinson, Rachel McCloud, Mitchell Floura, Kellen Andersen, and Amelia Malling; (standing) Victoria Clawson, Avery Davidson, Shelby Rolfhus, McKenna Evans, Randi Lemkuhl, Carly Lemkuhl, Natasha Meed, Taylor Loesch, Elizabeth Clawson, Matthew Floura, and Mackenzie Laughlin. Not pictures are Alyona Binsfeld, Deana Hartmann, and Kendra Hengel. Friday, March 10, at 7 p.m.
Saturday, March 11, 1:30 p.m.
Community Education mini-theater will present - "The True Story of Snow White and the Seven Dwarfs?" - on Friday, March 10, at 7 p.m. and on Saturday, March 11, at 1:30 p.m. in the school auditorium. Admission is $3 for adults and $1 for students; preschoolers are free.